What are Swabs & Applicators? If you’ve used a Q-Tip, you already know what a swab basically is. However, there are many more uses and variations of Swabs & Applicators (AKA single-use applicators). Learn about swab tips and shaft materials, and their uses. A small piece of absorbent material attached to the end of a stick/shaft or wire, and used for cleaning a surface, applying medicine/chemicals, or collecting a sample of a substance. 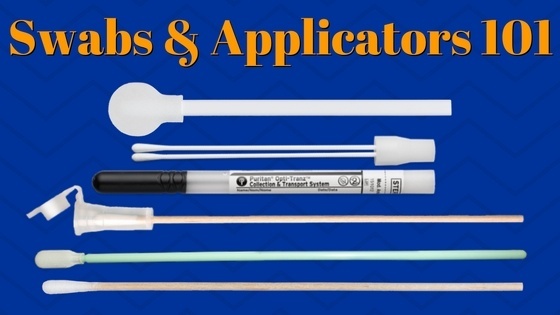 Common uses for swabs and applicators include: cleaning hard to reach areas, applying solvents/chemicals, wound cleaning, applying medicine, collecting samples. Single-use swabs are widely used in healthcare, diagnostic, forensic, controlled environments (cleanrooms), food safety, and drug manufacturing industries. Swabs tips come in many different materials. Here are some of the most common swab tip materials. Our cotton tip swabs are made with top pharmaceutical grade spun cotton fiber. 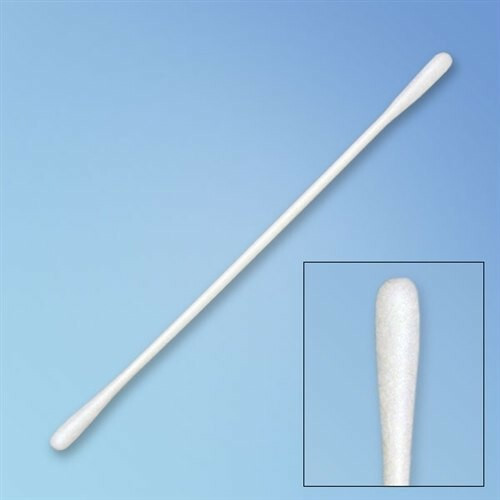 Cotton fiber swabs are absorbent, soft, low cost, and safe for many applications. If you require low-lint for your application, cotton swabs are available in low-lint options or standard. 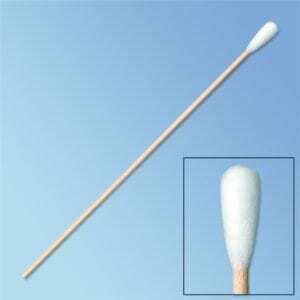 Whether you require 3 inch cotton swabs, 6 inch cotton swabs, or double tip cotton swabs (twice the bang for your buck!) 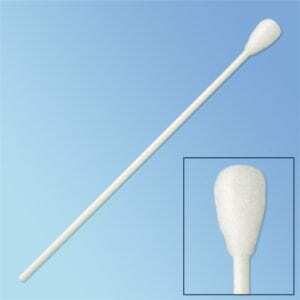 we are sure to have the cotton swab you need. Polyester is a synthetic fiber. Polyester tip swabs are non-absorbent. Polyester swabs also contain no fatty acids or latent sugars. This is important in the collection of specimens for testing. Polyester swabs are a good medium for cell collection, screenings, and testing. Ideal for use in microbiology, rapid test diagnostics, and industrial surface testing. 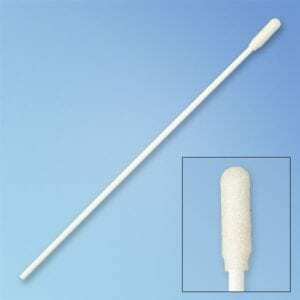 Foam swabs are made of soft, non-abrasive polyurethane foam. Foam swabs are lint and residue free. They won’t leave anything behind. Foam swabs are also shred-resistant and perfect for cleaning applications. The foam tips are thermally bonded to the shaft, so there is no glue or bonding agents in the swab that could contaminate your environment. Foam swabs are soft enough for delicate cleaning but not too soft that they bend or fold. Rayon is a semisynthetic fiber material made from cellulose. Rayon swabs are soft, highly absorbent and ideal for applications where cotton wouldn’t be suitable. Rayon is low-linting. Rayon swabs are widely used in specimen collection, testing, and screening. Flocked swabs have a unique tip structure and construction. 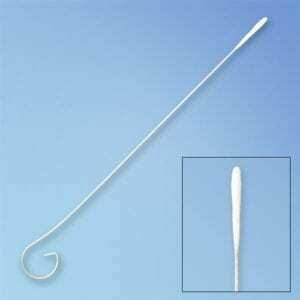 Flocked tip swabs are comprised of multi-length fibers arranged around the applicator handle. This brush-like structure assures ultra-clean tips and reliable performance. Unlike traditional wound fiber swabs, flocked swabs have no internal core to absorb and trap collected specimens. Flocked swabs have superior collection and release characteristics which make them ideal for specimen collection and testing purposes. The process starts with producing the swab fiber, composed of a unique porous microchannel “fiber-within-fiber” design structure. The swab fiber is then applied to tips to produce a versatile, high-performance brush-like swab without an inner fabric or core to collect specimens. Further proprietary manufacturing processes result in multi-length, “split-end” fibers that create a greater overall surface area and tension for more rapid elution and maximal sample preservation. Scientific studies have confirmed Puritan flocked swabs provide the most efficient collection and elution on the market. Microfiber swabs are highly resistant to normal cleaning solvents, which make them perfect for removing contaminants and excess materials. Microfiber tip swabs are soft, non-abrasive (wont scratch delicate surfaces! ), and has excellent wipe/dry characteristics lending itself to cleaning applications. Depending your application, there are different types of swab shaft materials you should use. Economical and rigid, these shafts do the job for many applications. The down side? Wood is a natural material with variations in moisture content and fracturing is possible. Wood dust from these shafts is minimal, but in areas where particulates is a problem, wood should not be used. Non-linting and non-conductive, these clean, white shafts are good for use in controlled environments. Semi-rigid, they will not fracture in use, but if bent will not return to the original shape. Paper shaft swabs cannot be sterilized by autoclaving. Very clean and non-absorbent with no particulate to shed. Can be rigid or semi-flexible and resistant to breakage. This plastic material will stand up to many chemicals. Autoclaving to 250 degrees F is OK. Economical plastic shafts can be hollow or solid. Also very clean and non-absorbent, non-dusting. Depending on the composition can fracture as needed, or be flexible for use in tight spaces. Suitable for use with IPA. More rigid than polypropylene. This material is suited for applicators with scored break points, providing a clean break. Slender and flexible but once bent will retain the angle for precise cleaning. Clean with no particulates, but conductive. For medical applications, slender dimension is desirable. ESD swabs have anti-static properties that make them safe for working with static-sensitive components. Anti-Static & ESD-Safe Swabs are ideal for precision cleaning, sampling, validation, and more. ESD swabs have special antistatic handles that make them ideal for use in cleanrooms and other static-sensitive environments. We offer ESD/Anti-Static swabs that are foam tipped, polyester tipped, cotton tipped, and nonwoven tipped with anti-static attributes. There are primarily two types of transport swabs. Dry transport swabs consist of a dry swab and transport tube or cap. Media Transport Swabs are a vial of transport medium liquid and dry swab. This “wet” transport swab keeps collected specimens suspended in a liquid medium for testing. Both Dry Transport and Media Transport Swabs are used for collection and/or transportation of a wide range of specimens (including: bacteria, viruses, microorganisms, trace evidence, DNA, and more). The transport tube/vial contains the specimen and provides safe and stable transport. Environmental Sampling and Surface Testing swabs are used for industries in food, pharmaceutical, and cosmetics. Surface Testing Swabs are designed for sample collection and validation of hard to reach areas. Surface testing swabs are used to test for contamination and chemicals on surfaces. Environmental Sampling Kits consist of a polyester tipped swab and polypropylene vial for transport with broth/solution/buffer liquid. Sterile/Medical Swabs have a wide range of uses. Our sterile medical swabs are offered in Rayon and Cotton, available in a variety of head shapes. Handle options include wood, plastic and biodegradable paper. Sterile Swabs are wrapped and always fresh. Ideal for medical applications such as wound care, surgery, diagnostic testing, DNA testing, Gynecological OB/GYN screening, and more. Wood Applicators include applicator sticks, cuticle/orange sticks, and wood medical spoons. Disposable wooden applicators are often used for specimen transfer, as mixing rods, in laboratory work, and other general purpose applications. Our wood applicators are made with straight-cut splinter-free ends. Wood Applicator Sticks come with different bevels, points, or straight edges depending on your use need. Wood applicator sticks are biodegradable and available sterile or non-sterile. You can’t use any old swab in a Cleanroom. Critical Environment Swabs are precision manufactured, ensuring the swabs eliminate contamination and provide consistent cleanliness. Critical Environment Swabs are available in materials such as cotton, microfiber, knitted polyester, and anti-static/ESD. Cleanroom Swabs are designed for effectively cleaning small surfaces in controlled environments and other critical environment applications. Cleanroom swabs are widely used in industries such as healthcare, diagnostics, fiber optics, electronics, semiconductors, and more. When it comes to swabs and applicators, there are a lot of variations to consider depending on your usage case. With so many options we know it can get a little overwhelming. But don’t worry! We’re here to help. If you’re not sure exactly what you need, we are available to help via Phone, Chat, or Email. Feel free to contact us if you have any questions selecting the right swab for you and your application. Harmony offers the best quality and selection of swabs and applicators for use in Spas, Salons, and so much more! We’ve chosen to supply primarily Puritan Medical swabs and applicators due to their supreme quality and value. Puritan produces high-quality swabs and other single-use products for industries such as healthcare, forensics, and food safety. These products are medical-grade swabs with fantastic beauty and wellness applications too. 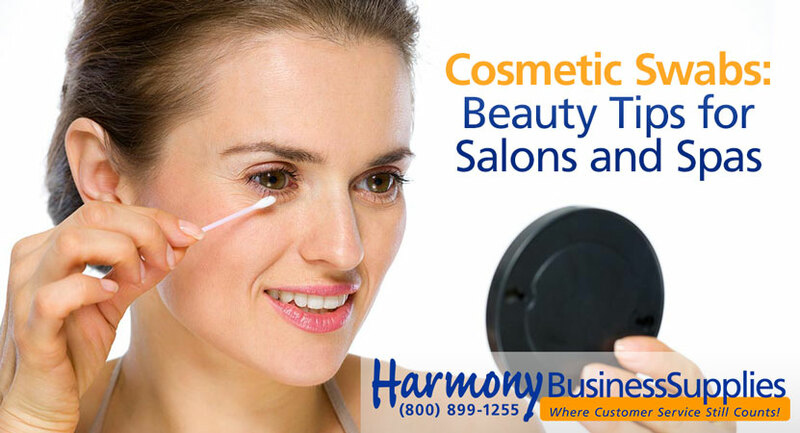 From cotton swabs to cuticle sticks, Harmony and Puritan Medical can help spa and salon owners keep clients looking their best. Spring is around the corner and there’s going to be lots of events like vacations, proms, weddings – people need to be photo ready! Here are some great beauty tips, advice, and tricks made possible by high quality cosmetic swabs and applicators. Cutting-edge technology has been used to produce high-quality cotton swabs which are almost enough on their own to perform every part of a beauty routine. From facials to pedicures, Puritan Swabs from Harmony are highly resourceful as a tool used in a wide range of beauty and salon services. Here’s some great ways to use swabs for beauty! Use a swab to precisely cover a blemish with just enough concealer. Target dark spots with brightening cream in the same manner. Use a swab to get every last bit of lipstick out of the tube before tossing it. Lip-gloss comes in a pot right? So keep your fingers clean by applying with a cotton swab. Don’t let bright lipsticks or stains bleed outside your clients’ lip line. With a swab, you can trace her pout with powder to keep lip color in place. Avoid sticky fingers when applying eyelash glue to false eyelashes by using cotton swab to disperse the glue. Use a swab to dot concealer on undereye circles, then blend. Cotton swabs are the perfect tool for smudging or cleaning up eyeliner. Embellish nails by using a swab to create designs (adorable polka dots!) or add decorations. The pointed cotton tip on our tapered swabs can clean up the messiest manicure or pedicure. Cleaning bottle necks with swabs dipped in nail polish remover keeps polishes from getting stuck shut. Bonus TIP: Seal swabs covered in concealer or perfume in small storage bags and tuck them into your purse. You’ll be able to touch up your makeup or reapply your favorite scent while at a wedding or during a long flight. Isn’t it amazing how much better you feel after an eyebrow wax? Well, our tongue depressors were actually designed to apply wax too! The wood has a smooth polish, and with two different sizes, the sticks can be used on multiple areas of the body. Keeping nails clean is good for hygiene and for first impressions. We offer cuticle sticks with beveled ends that are just the right tool for pushing cuticles back into place. Our single bevel sticks with pointed ends can clean out dirt and other built up grime. Whether thanking an instructor for vacation surfing lessons or meeting a cousin’s new boyfriend at a family gathering, your clients will confidently extend their hands knowing they look great! You can trust our swabs and applicators to perform the best, no matter your usage! Feel great, look great, and enjoy a moment of Harmony with Puritan Medical Swabs and Applicators.